Q: Yesterday at the press conference, Indian journalists asked about when China will reopen the Nathu-la pass for Indian officially-organized pilgrims' journey to Xi Zang. When did China open this route for pilgrimage? What is China's consideration behind? Based on what you said yesterday, can we assume that China would only consider reopening the route when the Indian border troops return to the Indian side of the boundary? A: As I said yesterday, in the interests of China-India friendly relations, the Chinese side has made enormous efforts against all odds to facilitate Indian officially-organized pilgrims' trip to Xi Zang. In the light of the consensus between leaders of China and India, and the fact that the Sikkim section of the China-India boundary has been delimited as recognized by both countries, the Chinese side approved the opening of the pilgrimage route via the Nathu-la pass in the Sikkim section of the China-India boundary for officially-organized Indian pilgrims in 2015. The arrangements ran well over the past two years, and the relevant department of China has previously made preparation for this year's reception. We have told the Indian side that the arrangement was put off as an emergency measure in response to the change of the situation caused by the Indian border troops' trespass. I want to stress that Indian pilgrims' trip to Xi Zang requires necessary atmosphere and conditions. The Indian side is to blame for the trip not being able to take place as scheduled. As for when the pilgrimage route will reopen, it totally depends on whether the Indian side can correct its mistake in time. Q: Deputy Russian Foreign Minister Igor Morgulov told Sputnik that Russia has drafted and is coordinating with China a road map on denuclearization of the Korean Peninsula and overall peace of Northeast Asia. He said that Russia supports China's "dual track approach" and "suspension-for-suspension proposal", opposes broad interpretation of UN sanctions on the DPRK and individual states' economic restrictions on the DPRK, and supports the US and the DPRK in conducting dialogue with no strings attached. What is China's comment on that? A: The Chinese side welcomes all the constructive efforts conducive to denuclearization, peace and stability of the Korean Peninsula, and is open to Russia's proposal in this regard. China and Russia are comprehensive strategic partners of coordination who maintain close communication and coordination on international and regional affairs. By putting forward the "dual track approach" and the "suspension-for-suspension proposal", China is aiming at addressing the most pressing concerns of different parties, and making a breakthrough for the resumption of talks. 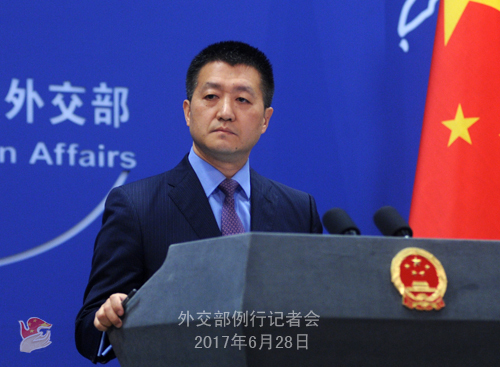 China's approach and proposal have won support and understanding from more and more countries, and coincide perfectly with Russia's suggestion. China and Russia are in close communication on the road map. The Chinese side believes that to fully implement UN Security Council resolutions on the DPRK, we should not only try to prevent the DPRK from developing nuclear and missile programs, but also stay committed to resolving the issue through peaceful means, and in particular, avoid any words or deeds that may heighten the tension. The DPRK and the US are parties directly concerned to the nuclear issue on the Korean Peninsula. They are holding the key to resolving the issue. The Chinese side welcomes the improvement of DPRK-US relations through direct talks, so as to create conditions for the final settlement of the issue. Q: China National Petroleum Corporation (CNPC) has suspended its fuel sales to the DPRK. Although it is said to be a commercial decision, did the Chinese government put pressure on CNPC to suspend the fuel sales? A: I am not aware of what you said. Q: China will serve as the rotating president of the UN Security Council (UNSC) this July. Does China plan to hold conferences with Russia during this period on international issues, such as the Korean Peninsula issue and the conflicts in Syria? A: That's right. China will take over the UNSC rotating presidency this July. China, as a permanent member of the UNSC, knows full well that the UNSC shoulders main responsibilities in safeguarding world peace and stability under the UN Charter. The common practice is that the rotating president for each month holds open sessions or debates on issues that the international community, the UN members in particular, concerns most, in a bid to gather international consensus. In order to do a great job during its presidency, China now maintains close communication and coordination with the other 14 UNSC members to list out issues that the international community pays special attention to and call for concerted response from UNSC members. We hope our work can earn the support of Russia and other UNSC members. China is communicating with all relevant parties on the agenda of the UNSC in July. We hope to share with you our plan at an early date. Q: Previously we heard from the Foreign Ministry that talks are going on between China and India on the standoff in the Sikkim section. Is there any progress? A: The Indian border troops overstepped the mutually recognized boundary line at the Sikkim section and crossed into the Chinese territory. That is essentially different from previous fictions between the two troops in the border areas where the boundary is yet to be delimited. 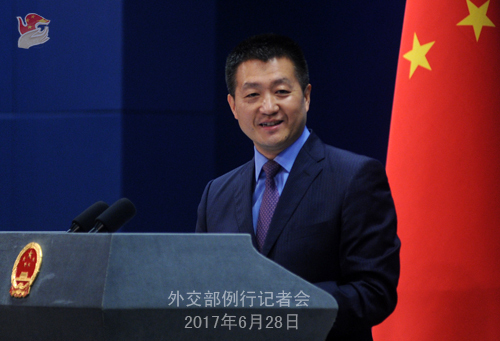 The Chinese side has lodged solemn representations with the Indian side in Beijing and Delhi, requiring them to observe existing boundary convention, respect China's territorial sovereignty, immediately withdraw the border troops that crossed into China and take concrete actions to maintain peace and tranquility in the border areas. Q: During State Councilor Yang Jiechi's visit to the US last week, he met with President Trump's senior adviser Jared Kushner and national security adviser H.R. McMaster. President Trump dropped by this meeting according to US government sources. Does China think the meeting successful? What did State Councilor Yang and President Trump talk about? As I understand subjects of the meeting include the DPRK and trade. A: First of all, the inaugural China-US Diplomatic and Security Dialogue (D&SD) held in Washington D.C. last week was a great success. The two sides have released relevant information on this. 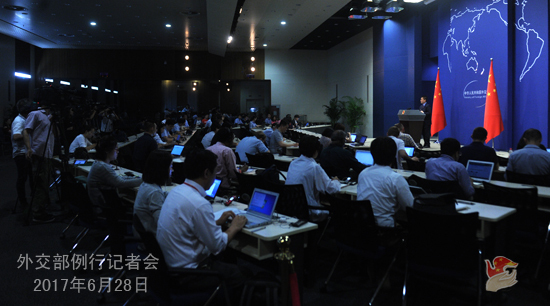 You can find online the consensus reached between the two sides at the dialogue, from which we can see that the two sides covered a wide range of topics with China-US relations at the center. The two sides started the dialogue with this topic and reached broad consensus on high-level exchanges at the next stage, enhancing mutual trust, expanding bilateral cooperation in various fields and broadening the space for cooperation. Some international and regional issues of common concern were also discussed, including the Korean Peninsula nuclear issue and other regional hot-spot issues. We have issued a press release on President Trump's meeting with State Councilor Yang Jiechi at the White House on June 22. During the meeting, both President Trump and State Councilor Yang Jiechi spoke highly of the just concluded D&SD and expressed positive expectations for high-level interaction between China and the US at the next stage. President Trump said that he is looking forward to meeting with President Xi Jinping on the sidelines of the G20 Hamburg Summit next week and paying a state visit to China by the end of this year. The two sides also discussed the Korean Peninsula issue. Relevant information has been released, and I will not repeat it here. Q: Indian Prime Minister Narendra Modi met with President Trump during his recent visit to Washington. A joint statement issued at the end of his visit said that a close partnership between the US and India is central to peace and stability in the Indo-Pacific region. Also, the US has welcomed India's role in Afghanistan in retaining democracy and stability. The two leaders also called on Pakistan to ensure its territory not to be used to launch terrorist attacks on other countries. The US has also designated Pakistan-based militant leader Salahuddin as a global terrorist. I would like to have your reaction to the overall visit by Prime Minister Modi to the US. A: I believe you are fully aware of China's position on the aforementioned issues. We have been saying that China welcomes friendly and cooperative relations among all countries, and hope that such kind of relations will contribute to peace, stability and prosperity of the region and beyond. As for Prime Minister Modi's visit to the US and his discussion with the US on relevant issues, we think it is quite normal for leaders of two countries to talk about issues of common interest, as long as their interaction is conducive to peace, stability, and prosperity of Asia. Regarding counter-terrorism and issues relating to other countries in the region, we have noted the relevant reports. I would like to say that the Chinese government is consistent and clear on counter-terrorism. We oppose all forms of terrorism and linking terrorism with any specific country. We call for international cooperation against terrorism on the basis of mutual respect. I must say that Pakistan is at the forefront of counter-terrorism and has made important contribution to the international campaign against terrorism. We maintain that the international community should step up cooperation against terrorism, and should also fully recognize Pakistan's efforts in this regard. On what you said about the discussion and consensus between American and Indian leaders on the issue of Afghanistan, I want to say that realization of peace and stability in Afghanistan at an early date serves the common interests of the whole region. 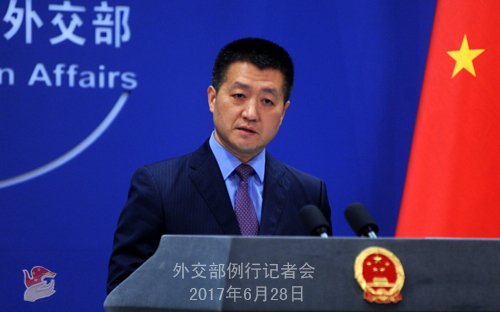 China always supports the "Afghan-led and Afghan-owned" reconciliation process which is inclusive. We also welcome all parties' constructive efforts in this aspect. Q: The Japanese consul general based in Atlanta reportedly claimed that there was no evidence that the Japanese military sexually enslaved women during World War II, and he also argued that the women were rather paid prostitutes. The spokesperson of the ROK Foreign Ministry said that they will take necessary steps after verifying the report. What is China's comment on that? A: I have also noted the report. The international community should be alarmed at the remarks made by the Japanese government official. It reveals once again that some people in Japan are still reluctant to face the history, and even try to deny and distort the history. We all know that the forced recruitment of comfort women is a grave crime against humanity committed in the victimized Asian countries by the Japanese militarism during WWII. Ironclad evidence brooks no denial. We have told the Japanese side with all seriousness that Japan will never be able to unload the heavy burden of history if it refuses to face up to and reflect upon the history. We once again urge the Japanese side to take the history as a mirror, face squarely the international community's concerns and deal with relevant issues in a responsible attitude. Q: First, the US Trafficking in Persons Report demoted China to the lowest ranking. US Secretary of State Rex Tillerson said it was because Beijing did not make significant efforts to eliminate trafficking. He also talked about China's acceptance of laborers from the DPRK. What is China's response to the report and Tillerson's remarks? Second, it is reported that Premier Li Keqiang accepted in Dalian Singapore's invitation for a visit. Can you confirm that? A: China's position on the annual US report remains unchanged. The US issues such kind of report every year, making irresponsible remarks on the internal affairs of other countries. The Chinese side opposes that. We are not combating crimes such as human trafficking for any other countries' sake, we are doing so because it is an inherent part of China's social governance and development. We also approve of cooperating with other countries on this based on mutual respect, but no country in the world has the right to make irresponsible remarks about other's internal affairs. On your second question, yesterday Premier Li Keqiang met with Deputy Prime Minister of Singapore Tharman Shanmugaratnam who was in Dalian for the summer Davos. The two sides had good talks on the bilateral relations, practical cooperation under current circumstances, and flagship cooperation projects in particular. If there is any information about the arrangement for high-level visits between China and Singapore, we will let you know. Q: China refers to the area where the standoff took place as "Doklam". Some reports say that Doklam is part of the territorial disputes between China and Bhutan. Can you make clarification on that? A: Doklam has been a part of China since ancient times. It does not belong to Bhutan, still less India. That is an indisputable fact supported by historical and jurisprudential evidence, and the ground situation. It is utterly unjustifiable if the Indian side wants to make an issue of it. China's construction of road in Doklam is an act of sovereignty on its own territory. It is completely justified and lawful, and others have no right to interfere. I would like to stress once again that Bhutan is a world-recognized, independent sovereign state. We hope that all countries can respect Bhutan's sovereignty. Although the boundary between China and Bhutan is yet to be demarcated, the two sides have been working on that through peaceful negotiation. Any third party must not and does not have the right to interfere, still less make irresponsible moves or remarks that violate the fact. Q: You said that you hope other countries can respect Bhutan's sovereignty. Are you trying to say that India is meddling with China's activities on behalf of Bhutan? A: We can only tell whether India has interfered in Bhutan's internal affairs based on what India has said and done. As I said, although the boundary between China and Bhutan is yet to be demarcated, the two sides have been communicating over it in a friendly way. If any third party wants to interfere out of its own interests, then it shows no respect for Bhutan's sovereignty. That is what we do not want to see, given that Bhutan is a world-recognized country with full sovereignty. Q: A new round of ransomware attack has spread from Ukraine to Asia. Has China been affected? A: We need to learn more from the competent authorities. In principle, as we have been saying, we are opposed to any illegal cyber attacks such as hacker attacks. We believe that cyber security is a common challenge for all countries around the world and calls for concerted efforts of the international community which must be based on mutual respect and mutual benefit.